You’ve just taken your first NCLEX RN test – and the NCLEX Questions were nothing like the ones you used in your nursing review. Does that familiar or what? You feel cheated. Betrayed. Absolutely frustrated by all of the hard work you put into your NCLEX questions. And what was it all for? Absolutely nothing. You’re a few hundred bucks poorer, short of a nursing license and a laughingstock to your colleagues, who all managed to easily pass. After all, you bought a well known, trusted review book on Amazon or Barnes and Noble. You took thousands of free NCLEX RN practice questions. You realize even those those prep books gave you a warm fuzzy feeling of security and familiarity, it didn’t do anything to help you pass the NCLEX-RN exam. You may feel like storming to the National Council of State Boards of Nursing headquarters and demanding your money back. At the very worst, you feel like you were never meant to become a nurse – that you’re better off as a nursing student who failed to gain his or her license. Well, it’s time to shake away those blues, because we’re about to reveal how you can predict your NCLEX questions with 87% accuracy. Use this technique, and you’ll feel like you’re an NCLEX question psychic. Skip it, however, and you might as well kiss the money you spent on the exam – not to mention the thousands you spent in nursing school – good-bye. Isn’t it time you finally nailed down those NCLEX nursing questions once and for all? For all their pomp and circumstance, NCLEX test questions are quite predictable. Getting that 87% accuracy – and freeing yourself from the misery of failing the NCLEX yet again – doesn’t come down to predicting the exact wording of each NCLEX nursing question. Rather, it comes down to knowing what categories those state board nurses love to test. …And the rest is just child’s play. Are you ready to free yourself from the pain and agony of wondering why it seems like everyone is making progress in their review except for you? Then it’s time to move onto the next section – and see those six categories for yourself! And you’ll see many NCLEX questions on treating patients with hypertension and cardiac issues. So what happens if you start focusing on these six NCLEX test question categories? You notice that you start getting more questions correct on your practice tests. You’ll lower testing jitters, worries of the future knowing you’re studying what’s on the REAL exam, not hundreds of pages from your nursing textbooks. You slowly discover that you’re not afraid of the day when you take your nursing exam and get the success you deserve. You actually looking forward to it, because you know it will be the day that your dream career as a nurse will finally begin. Isn’t it time you put the guesswork aside? Take action now and spend at least 80% of your NCLEX prep time on these six testing areas IF you want to pass your RN test now. Want more help to crack-the-code of tough NCLEX questions? Then click on the blue text to see my free FREE exam review video called the: “The #1 Secret About NCLEX Review Questions Nobody Else Dares Tell You” right now. It’s no secret that the road to a career as registered nurse is paved with bumps and obstacles – including those difficult NCLEX questions. Think of your nursing career as a roadmap towards success. You’ve swiftly cruised by the traffic jam of tough nursing classes and NCSBN NCLEX RN review. You’ve accelerated through your hospital placement without even breaking a sweat. As far as you’re concerned, you’ve made it home clear to your ultimate destination: your nursing certification. But the last roadblock you’re about to face is a big one. And unless you want to crash and burn on your NCLEX questions, you’ll need powerful and innovative practice shortcuts. Listen: there are no easy roads to get to that nursing career you’ve always dreamed about. After all, the folks at the NCSBN or National Council Licensure Examination want to ensure that you’re 110% prepared to handle all of the responsibilities and roles that come with being an in-demand nurse. But this nugget of information doesn’t help when you’re face to face with real NCLEX exam questions – especially when you’ve had bad experiences with standardized tests before! The key to your exam success is to find NCLEX-RN review courses that make a difference. Forget those easy-peasy questions that make you feel like a kid in a candy shop. We’re talking about tough, but comprehensive review course that practically drag your nursing IQ to new heights. …The format of the exam. You’re sitting in front of your nursing exam. You read over the first test question and feel a sudden rush of nausea at what you’re facing. You prepared for NCSBN questions that would ask for direct answers – but now that you realize the standardized test is comprised of scenarios (no direct questions! ), you realize that you and this format aren’t going to get along. When you’re up against multiple choice RN questions that take on the form of a scenario, you might be tempted to run away screaming – but don’t resort to that just yet! Instead, take a deep breath and imagine how your favorite instructor would tackle this question. Create a picture of your classroom and put your instructor right in the front. Now imagine your instructor reading the question out loud and lecturing on it. What would your instructor say? What kind of questions would they ask? It might sound a bit silly at first, but visualize yourself as the star in your own nursing movie. Use your practice questions for the NCLEX to create the scene. As the star in the movie, you’ll have to act out each of the potential answers – so which one has the best success in your nursing movie? Whatever you do, do NOT answer the questions as a physician – the exam is full of traps like that! Instead, hold on to your “best practices” knowledge you already know, and resist the temptation to slip into the physician mentality. If you’re ready to take your success to the next level, click here: Free Review About NCLEX Prep and Test Taking now. 1.) The RN has a 64 year old hip replacement patient that is two days post op. Which assessment finding should be cause for concern? A. Make sure the patient takes no food or liquids. D.	Allow the patient to eat and drink whatever they want since they won’t be able to after surgery. A. The patient cannot eat fatty foods. B. The patient must not take OTC headache medication with this drug. C.	The patient must monitor their heart rate daily. D.	The patient must avoid alcohol. 6.) A medication order must have all of these components to be legally administered by the nurse. An increased temperature at this stage often indicates an infection that must be treated a.s.a.p. The nurse must also check the incision site for increased redness, swelling, drainage, and heat. A and D – Moderate pain is expected at this time. If ordered, administer pain meds one hour before physical therapy. B – Small amounts of drainage from a surgical site is normal at this stage. All prescribed antibiotics must be taken until they are all consumed. Stopping them early may leave the strongest bacteria alive to reproduce and cause a more serious infection. A – This statement is true. Nutritional requirements for the recuperating period after an illness are increased. C – Getting back to normal activities will increase the patient’s stamina and sense of well-being. D – The incentive spirometer is critical to normalizing lung function. It should be continued until the physician tells the patient it is no longer needed. An NPO order means “nothing by mouth”. In some instances, a small sip of water is allowed to swallow necessary medications only. B – No water is allowed if the patient is NPO. C – No fluid intake is allowed. D – Allowing an NPO patient to eat or drink can cause serious complications, and can also extend their hospital stay. Patients with this condition often present looking and acting normally. They are adept at covering their illness and “fitting in” with the normal population. A – The purging with diuretics, laxatives, and vomiting cause electrolyte imbalance, which may present as shakiness, mental confusion, and dizziness. C – Stomach acid from frequent regurgitation erodes the tooth enamel. D – Accelerated tooth decay results from the loss of protective tooth enamel. Alcohol increases the effect of Xanax, and the combination can be lethal. A – Patients taking Xanax may eat any type of diet they prefer. B – Over the counter, (OTC) medications such as Tylenol and Aspirin have no adverse effect with Xanax. However, some cold medications may interact and a physician should be consulted for anything other than simple OTC pain medicine. C – Monitoring of heart rate is not necessary with Xanax when taken as prescribed. All of these components are required on a legal medication administration order. A – This answer does not include the physician’s signature which is a mandatory component. The bedpan is the safest option for this patient while preserving dignity. A – The patient is dizzy and weak. A trip to the bathroom risks a fall or injury. B – The bedside toilet requires the patient to stand and pivot. This also increases the risk of a fall. C – A diaper reduces patient dignity and causes skin breakdown. Patients in a depressed state feel too listless and melancholy to plan and carry out a suicide. As the antidepressant begins to bring the patient out of this phase, they are more capable of planning and carrying out an attempt. This is a potential effect until the drug has neared its peak effect, and this time period depends on the medication. A – The first two weeks of antidepressant therapy rarely elicit a response in the patient. C – Once the peak therapy has been attained, and the patient has been on the medication for an average of 18 months, the patient may be weaned slowly to allow the normal brain function to take over. D – When antidepressant therapy has reached its full effect, the patient should have no inclination toward suicide. 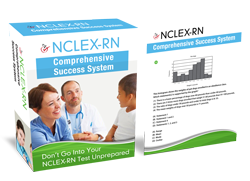 See this page: How To Pass Your NCLEX-RN And Tell Your Own Success Story now.